Glenglassaugh Distillery, standing on the Moray Firth coast at the edge of the beautiful Sandend Bay, lay silent and forgotten for over two decades. Its heritage stretches back to 1875 when the distillery was founded by Colonel James Moir. It was on the banks of Glassaugh burn that the distillery was built, and its name ‘Glenglassaugh’ – meaning ‘valley of the grey-green place’ – has been taken from its beautiful surroundings. The Glenglassaugh Coat of Arms represents the important connection between the distillery and the sea. The waves symbolise the influence of the coastal location on the character of our whisky and the gannets form the shape of a still. Our motto, Per Mare Per Terras, translates to ‘By Sea, By Land’. 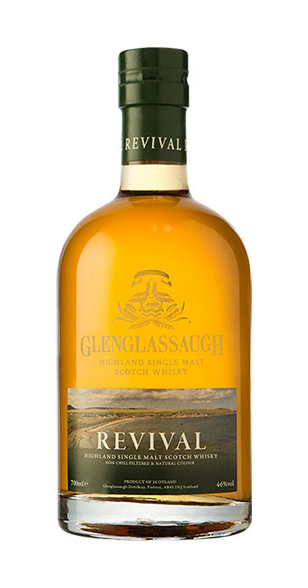 The unique location of Glenglassaugh Distillery borders the Speyside and Highland regions and also sits directly alongside a beach, Sandend Bay – this makes Glenglassaugh the only Scottish distillery with these three distinctive features. The character of the landscape is very apparent in the whisky; Speyside adding a tropical sweetness, Highland adding depth and richness, and the seaside giving the spirit a coastal charm. In terms of maturation, the coastal location has a particular impact of the flavour of the spirit. The wind coming from the sea travels into the warehouses, where our casks lie slowly maturing, adding a slight coastal influence to the whisky. After being mothballed for over 20 years, production restarted in 2008. The first whiskies from this resurrected distillery are now available to Single Malt Scotch Whisky lovers everywhere. Glenglassaugh is produced using the highest quality of Scottish barley and traditional distilling methods, our key focus being on quality. While many distilleries have become automated, at Glenglassaugh Distillery our spirit is still crafted by a small, highly skilled team dedicated to creating the finest quality product. Only the best casks are selected to slowly mature our precious spirit in our coastal warehouses until it is ready.